Chill wine to perfection and aerate while you pour with this handmade two-in-one pitcher. Enjoy a crisp Riesling at its optimal temperature or a full-bodied Pinot aerated to perfection with this beautiful two-in-one decanter. Handcrafted in Colombia, each unique design is free-formed into a tilted silhouette. An attached pocket for ice allows you to chill your favorite vintage once your guests arrive, while the fluted spout aerates the wine when pouring. Purchased this as a thank you gift for a client. He's a wine connoisseur and we've given him wine in the past. Wanted to find something different and unique, and this definitely fit the bill! He called as soon as he received it to thank us, and gushed about how unique and fun it was, and how he couldn't wait to use it that night. Glad we were able to find something wine related that he didn't already have! I love blown glass, especially green! There are a few small bubbles here and there that give it that look and also gives each item so much character! I love love love this! Bought this as a gift for friends who love their wine chilled. I read the reviews and had some concerns, but decided to try anyway. I agree that it looks lovely and is a great conversation piece. But it does appear that one needs more than one bottle of wine in the container in order for the chilling compartment to make contact adequately. Also, if you fill the chilling compartment fully, it appears that the melted ice could spill over when pouring the final contents of the pitcher. Since these are handmade, there will be irregularities. The one that I got worked well for aeration, but I'm not certain that it poured straight. Those of us who appreciate "handmade" usually accept these things as possibilities. But others might find it unacceptable. It does look like it would be difficult to clean. But all in all, it was well received by friends. 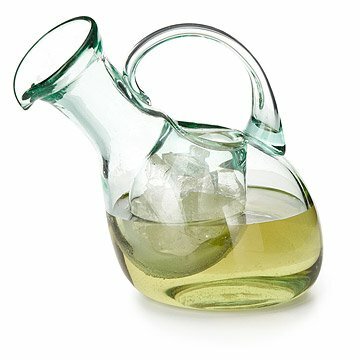 I use the decanter for serving wine and dinner to friends and family. Not only is it functional for keeping the white wine chilled, the unusual shape makes it a great conversation piece!! The product listing specified it could not be gift wrapped, but I still expected it to come in a box that I could wrap. It did not even come in a complete box, it was flimsy cardboard that was missing one of it's six sides. It was covered in bubble wrap, so it arrived safely, but I had to go out and buy a box for it. There was a small piece of paper explaining how the piece was made, but it did not even contain the name or use of the item. I love the look and feel of this wine decanter and it really chills a bottle of white wine nicely! Thank You! !